Looking for Pigeon Forge luxury cabins that are simply above the rest? You'll find exactly that at these premium cabins with a high level of luxury! From excellent resort amenities to spacious king bedrooms, these log cabins are designed to pamper you during your vacation. Simply search our cabins and rent the cabin of your dreams for the next time you travel to Pigeon Forge, TN! Reserve your luxury cabin today with Cabins USA to save 15% on your stay! Find Available Luxury Cabins! 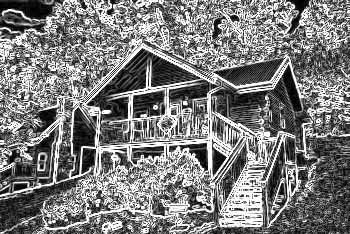 Cabins USA offers several luxury cabins in Pigeon Forge, TN and the surrounding area for vacationers looking for the ultimate cabin lodging. Featuring stylish furnishings, spectacular views, spacious rooms, and secluded locations, these Smoky Mountain luxury cabins invite you to truly unwind during your stay! These cabins in the Pigeon Forge allow you and your guests to enjoy a truly lavish mountain retreat that's close to the most popular sights in the Smokies. From Dollywood to historic Cades Cove in the national park to the charming shops of Downtown Gatlinburg, these luxury cabins for rent keep you close to all the action. Stepping into one of our luxurious Pigeon Forge cabins is like stepping into your own private spa retreat in the lush green hills of the Smokies. Cabins USA offers these cabins for an extraordinary cabin rental vacation for you and your guests. Imagine swimming in a private pool at one of our luxury Pigeon Forge cabin rentals with indoor pools where you can enjoy private swimming any time of year. Enjoy a movie experience to remember in one of our premium cabins with theater rooms that come complete with state-of-the-art surround sound, large flat screen televisions, and plush theater seating you won't find in any movie theater. Escape to your own private mountain oasis in your cabin's hot tub, jacuzzi, or private sauna. Our 5-star Smoky Mountain cabins with game rooms offer plenty of space to entertain. We also offer premium cabins in secluded settings, so you can enjoy beautiful scenery in comfort and style. Hosting a family reunion or group retreat and want all your guests to stay in the lap of luxury? Why not reserve a spacious large cabin with luxury amenities? Our 6-bedroom to 8-bedroom cabins provide accommodations to sleep large groups, but still provide lavish amenities such as multiple living areas, game rooms, large picture windows for taking in scenic views, and large bedrooms for each guest to enjoy rest and relaxation. Need space for four-legged vacationers as well? We also offer premium cabins that allow guests to bring small dogs. Remember, when booking any of Cabins USA's luxury cabins in Pigeon Forge and the Smokies area online, guests receive an 15% discount!